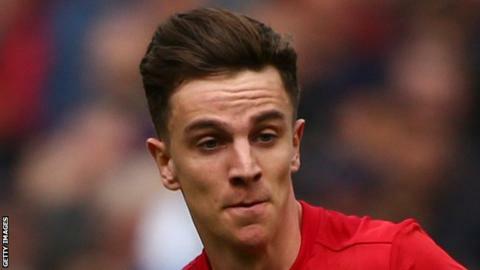 Preston North End have signed Manchester United forward Josh Harrop on a four-year contract. Harrop will join on 3 July after the two sides agreed a "significant undisclosed compensation agreement". The 21-year-old scored on his United debut in May, but turned down the offer of a new contract at Old Trafford. "It's a new start for me to get things going in my career and I'm buzzing to get playing and to make an impact in the team," he told the club website. Harrop was the top-scorer for United's reserve side last season, with 10 goals in 25 appearances. The versatile attacking player came to prominence when he netted in a 2-0 win over Crystal Palace at Old Trafford - his only first-team appearance for Jose Mourinho's side. He is Preston manager Simon Grayson's third summer signing, following the arrivals of Cork City striker Sean Maguire and Norwich goalkeeper Declan Rudd.